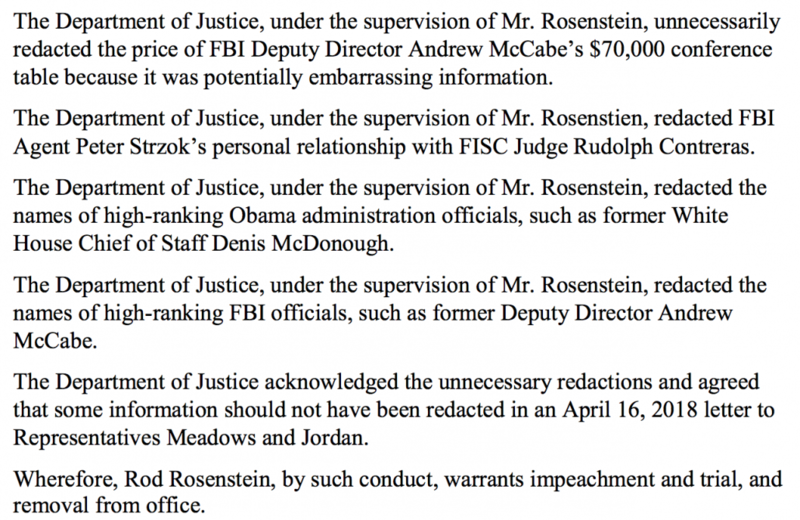 I was in DC when Mark Meadows and Jim Jordan rolled out articles of impeachment against Rod Rosenstein. 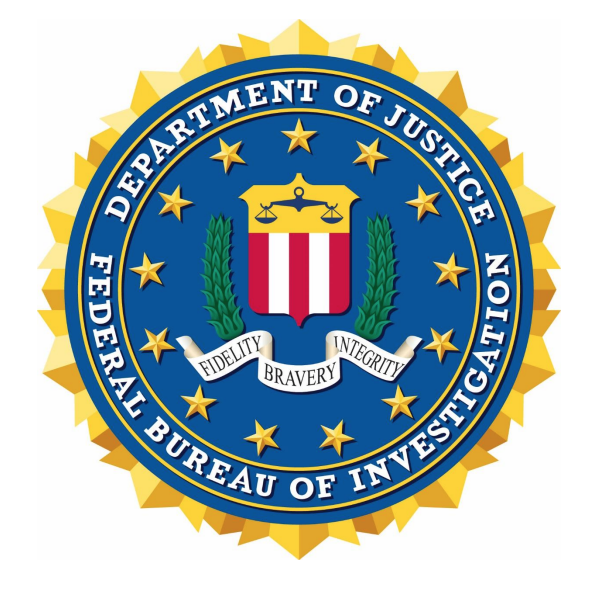 As a number of people have noted, the articles themselves are batshit crazy, calling over-redaction subsequently corrected a high crime and misdemeanor. 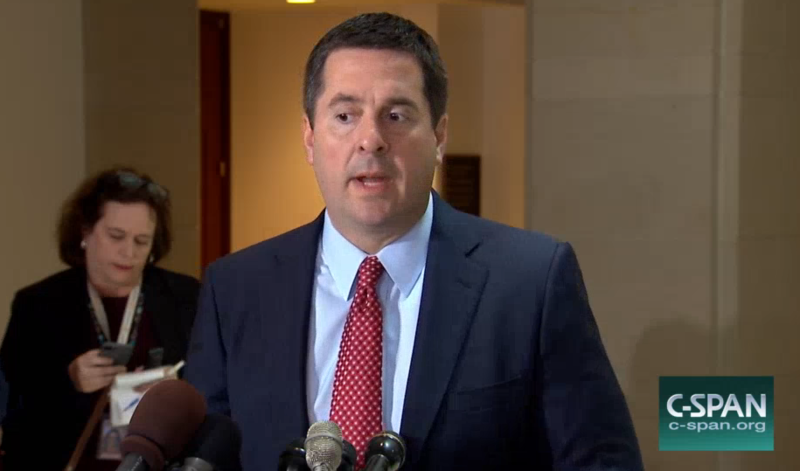 And some of the articles would require a time machine to prove, such as holding Rosenstein responsible for a FISA application submitted when he was merely the US Attorney for MD with no role in the investigation. But something else is even more interesting to me. By mid-morning yesterday, in the face of opposition from Paul Ryan and citing some deal with Bob Goodlatte, Meadows and Jordan admitted defeat. Shortly thereafter, Jordan announced a bid to be Speaker, with support from Meadows. 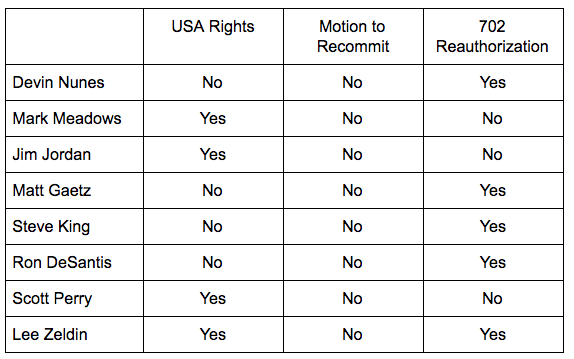 We’re two days into this effort, and thus far, two names are conspicuously absent: Devin Nunes (who has admittedly refrained from officially participating in some of the batshittery to — apparently — limit his legal exposure) and Ron DeSantis, who has spent the last seven months leading efforts to discredit Mueller’s investigation. While I was in DC, a Republican admitted to me that this was just about ginning up votes and predicted that the House is done meeting until November — meaning Rosenstein should be safe from Congressional tampering until then. If so, DeSantis’ non-participation in this stunt is telling. He’s running for governor with the vocal support of President Trump. 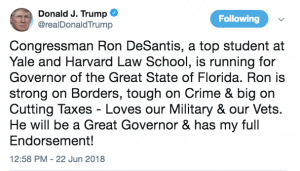 Indeed, DeSantis currently has a healthy lead against Adam Putnam in the GOP primary, with the primary date a month away, August 28, largely due to Trump’s support. 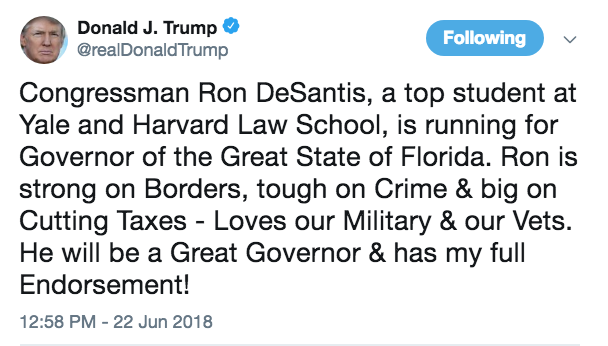 DeSantis is also one of the people who most obviously benefitted from Russian interference in 2016. That Ron DeSantis has not (yet) signed onto this stunt suggests he’s not sure that, in a month (or perhaps in three, in the general), having done so will benefit his electoral chances to be governor. So apparently Jim Jordan (facing sexual assault cover-up charges) and Duncan Hunter (facing even more serious legal troubles) think it’s a smart idea to go all-in on supporting Trump. But Ron DeSantis does not.